Nayiel’s path demonstrates upward momentum. Upon graduation from Seattle Nativity School in 2016, she attended Kennedy Catholic High School for her freshman and sophomore years, and transferred to the Running Start program at Seattle Central Community College. Nayiel has maintained a 3.8 GPA. 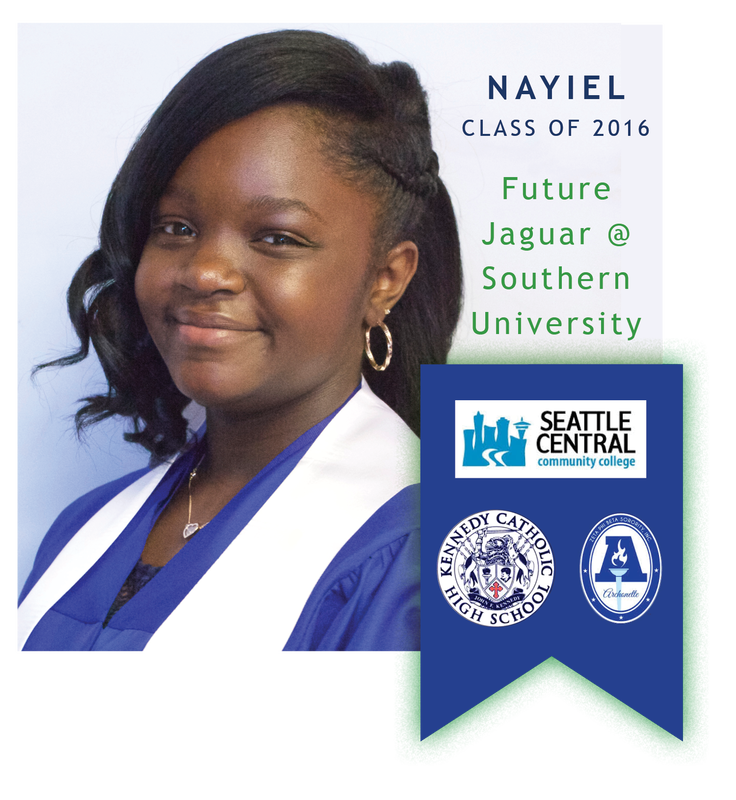 With great anticipation of the future, Nayiel reflects, “I have been taking college courses since fall of 2018 and will graduate from high school with my AA in Business. Then I will transfer to Southern University in Baton Rouge, Louisiana.” In her free-time, Nayiel continues with Northwest Tap Connection, taking classes and working as a TA for young dancers, 2-6 years of age. In addition to tap dancing, she participates in community service in the Puget Sound area through membership in the Archonettes chapter of the Zeta Phi Beta Sorority. While attending Nativity, Jada enjoyed photography, painting, and playing volleyball. She has been working very hard in her classes and has come to enjoy some of her more complex courses. “While attending Nativity, I learned how to find missing variables in math, velocity in science, and nouns and adjectives in ELA. Lastly, I learned about the Civil War in social studies.”Jada has utilized her time well in middle school and is excited to see what high school has in store. “What I am looking forward to the most next year is meeting new people and experiencing a new environment. ©2016 Seattle Nativity School All Rights Reserved.